Senior Citizen Support, Veterinary Natural Alcohol-FREE Liquid Extract, Pet Herbal Supplement Features: ALCOHOL-FREE! NON GMO! GLUTEN FREE! 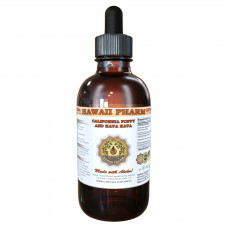 Hawaii Pharm Senior Citizen Support Supplement contains no GMO, gluten, heavy metals, artificial colors, pr..
Senior Complete, Veterinary Natural Alcohol-FREE Liquid Extract, Pet Herbal Supplement Features: ALCOHOL-FREE! NON GMO! GLUTEN FREE! Hawaii Pharm Senior Complete Supplement contains no GMO, gluten, heavy metals, artificial colors, preservat..
Senior Formula, Veterinary Natural Alcohol-FREE Liquid Extract, Pet Herbal Supplement Features: ALCOHOL-FREE! NON GMO! GLUTEN FREE! Hawaii Pharm Senior Formula Pet Supplement contains no GMO, gluten, heavy metals, artificial colors, preservatives .. Skin Comfort, Veterinary Natural Alcohol-FREE Liquid Extract, Pet Herbal Supplement Features: ALCOHOL-FREE! NON GMO! GLUTEN FREE! Hawaii Pharm Skin Comfort Supplement contains no GMO, gluten, heavy metals, artificial colors, preservatives or synth..
Skullcap, Veterinary Natural Alcohol-FREE Liquid Extract, Pet Herbal Supplement Features: ALCOHOL-FREE! NON GMO! GLUTEN FREE! Hawaii Pharm Skullcap Supplement contains no GMO, gluten, heavy metals, artificial colors, preservatives or synthe..
Skullcap-Valerian, Veterinary Natural Alcohol-FREE Liquid Extract, Pet Herbal Supplement Features: ALCOHOL-FREE! NON GMO! GLUTEN FREE! Hawaii Pharm Skullcap-Valerian Supplement contains no GMO, gluten, heavy metals, artificial colors, prese.. Slim Pet, Veterinary Natural Alcohol-FREE Liquid Extract, Pet Herbal Supplement Features: ALCOHOL-FREE! NON GMO! GLUTEN FREE! Hawaii Pharm Slim Pet Supplement contains no GMO, gluten, heavy metals, artificial colors, preservatives or synthetic fer.. Stress Stop, Veterinary Natural Alcohol-FREE Liquid Extract, Pet Herbal Supplement Features: ALCOHOL-FREE! NON GMO! GLUTEN FREE! Hawaii Pharm Stress Stop Supplement contains no GMO, gluten, heavy metals, artificial colors, preservatives or ..
Stress-Free, Veterinary Natural Alcohol-FREE Liquid Extract, Pet Herbal Supplement Features: ALCOHOL-FREE! NON GMO! GLUTEN FREE! Hawaii Pharm Stress-Free Supplement contains no GMO, gluten, heavy metals, artificial colors, preservatives or synthet..